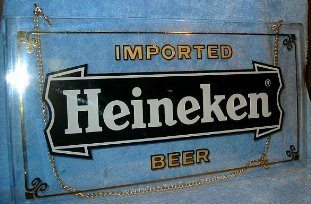 Heineken Beer; 18 x 9 1/2 inch, hanging sign. Heavy clear plastic with sturdy gold hanging chain. Some minor scuff marks. Nice and not a bunch around. Newer vintage, but not current.